So far, I have successfully taught one out of four of my children to read. While that is incredibly encouraging and exciting, I was definitely not confident and sure of myself when we first started on this journey! I’m a math teacher. I don’t know anything about teaching reading! What I have realized, however, is that for many homeschooling moms, it’s just the opposite. The thought of teaching your kids math is terrifying. Maybe you were never “good” at math. Or maybe you just always hated it. Whatever the reason, I know how hard it can be to move forward and teach what needs to be taught when you lack the confidence. I have even felt this way when I was teaching in a high school math classroom. If you are a classroom teacher, you know that you don’t always get a say in what classes or subjects you teach! If you want to accurately and to the best of your ability teach a math concept (or any subject for that matter) you must know the content inside and out. If you’re struggling to help your kids understand and remember algebraic properties, for example, go read and learn everything you can about them! Or better yet, go and watch some videos together, and then discuss them! If you struggle to teach your kids math because it was something that you hated in school, learn to love it and see the beauty in patterns and numbers! Math can be fun and intriguing, so find a math puzzle or an interesting question that comes up in your day (“I wonder how many…”) and sit down and really think about it. Try different methods to solve it. Look at it from different angles. As you learn to look at numbers and patterns and appreciate the joy of learning and exploration, you will be more inclined to sit with your kids and watch them explore and learn too. And if your kids see not only how interested you are in math, but that you are willing to work on hard problems and even be “stumped” by something, they will be more willing to put in the effort and hard work too! Want a fun way to do math together as a family? Check out Bedtime Math ! When I was a classroom teacher, especially in high school, I always had at least 3 textbooks I would pull from. Some textbooks (or homeschool curriculum) are just better than others. So if I had to teach a topic that I was not as familiar with or was perhaps something that I never even learned when I was in school, I would read other textbooks to see how they explained it. Even if I understood the way it was presented in our “official” text, that wasn’t necessarily the best or easiest way to present it to my students. If you are struggling with a particular topic, go to the library and see if they have math textbooks you can look at or even check out. If you have other homeschooling friends, try to find the same topic in their curriculum or book and see how it’s taught. There is always more than one way to solve a math problem, so if what you and your kids are trying isn’t working, find another way! There are plenty of resources out there written by people much smarter and wiser than I am who can help you find the best practices when it comes to teaching math. I know the thought of adding something else to your list might seem overwhelming, but maybe over the summer you can find one book on teaching a particular topic that you feel your child struggles with so that next year you can both approach it with more confidence. For example, if you want to do a better, more thorough job of teaching fractions, check out Beyond Pizzas and Pies by Julie McNamara. 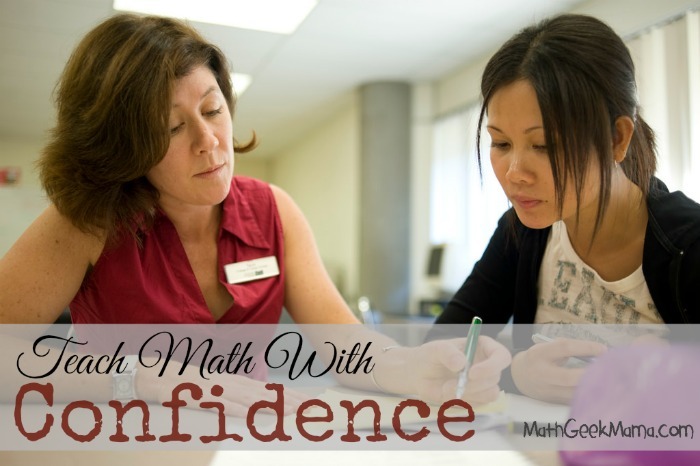 Or if you simply want to feel more confident in general, as well as glean some ideas for making math more enjoyable for you and your kids, check out What’s Math Got to Do with It? by Jo Boaler. Another excellent resource for best teaching practices and helpful and fun lesson ideas is the National Council of Teachers of Mathematics website. While there are a lot of resources there that require a membership, there is still TONS of helpful information that can be found for free. If your kids are getting stuck on a particular topic or concept and everyone is getting frustrated or things are ending in tears, re-evaluate and see if this is something you can just shelf for a while. Just because it is the next thing in your book or curriculum does not necessarily mean it has to be covered in that order. If you were to take five different fourth grade math curricula and compare the scope (what topics are taught) as well as the sequence (the order in which concepts are taught), you will get five different opinions. So step back and see if this is really something that has to be mastered right now, and if not, move on to something else and come back to it later in the year or even the following year. What do you think? Is this helpful? What tips would you add to the list? What more help and encouragement for teaching math? Sign up for my weekly email newsletter and never miss a thing, PLUS get exclusive math teaching materials FREE!